Email celebrates its 46th birthday this year, and what a journey it’s been. Did you know that email actually predates the internet? While most technology gets replaced by smaller and more powerful solutions, email traversed the technological revolution virtually unscathed. Even more impressive is that it’s still growing in popularity. 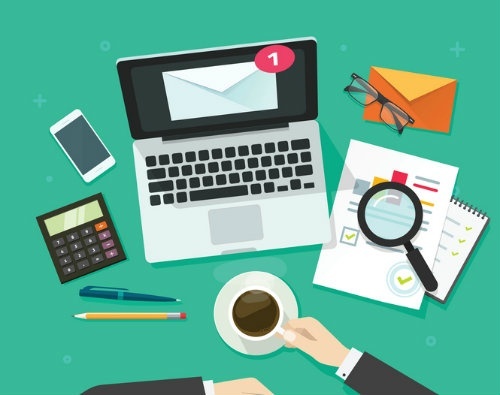 Prepare to be astounded by these surprising facts about the history of email marketing. #1. The first electronic mail was sent in 1971 by Ray Tomlinson (Source). #2. The first email marketing blast was sent in 1978 (Source). The sender was a man named Gary Thuerk who worked for Digital Equipment Corp. His email blast was sent to 400 recipients as a promotion for his company’s computers, and it actually resulted in $13 million in sales. Taking into account inflation, that’s equivalent to about $78.8 million today. Consequently, this email is also considered the first spam message. #3. In 1989, experts predicted that other technologies would soon replace email (Source). Namely, the fax machine. They never imagined that a “paperless” world was possible. They also failed to foresee how email would transform direct mail marketing. #4. Hotmail sparked the explosion of email marketing (Source). When the internet went live in 1991, email was primarily used by universities or for corporate communications. The general public saw it as a novelty and still too expensive for everyday use. On July 4, 1996, Hotmail launched the first free web-based email service. In doing so, they opened up a direct line of communication to potentially 20 million American internet users. Marketers saw the opportunity and jumped in head first. In December 1996, web-hosting company Xoom sent a marketing email to 6 million internet users to advertise their “Email Robot” — an anti-spam filtering tool. #6. As of 2015, there were 2.6 billion email users worldwide (Source). But over 50 percent of the emails received were spam (Source). While this is certainly a large percentage, it’s a substantial improvement over 2008 when spam accounted for 92.6 percent of total email traffic. However, your audience is likely still overly cautious, so relevant, personalized email campaigns are an absolute necessity. #7. The No. 1 reason people unsubscribe from emails is they simply get too many (Source). The second reason most people unsubscribe from emails is the lack of relevancy, followed by too many emails received from a particular company. It’s still hard to believe email is nearly 50 years old and that it actually predates the internet. Feel free to share any of these surprising facts about the history of email marketing with your colleagues. And if you’re interested in seeing where email marketing is headed, check out TowerData’s 2017 predictions for email marketing. Start creating your own list of facts with Email Intelligence, which provides data on 80 percent of your email list. Get your free match report now.